One dose of an insecticide can kill three generations of cockroaches as they feed off of each other and transfer the poison, according to Purdue University entomologists who tested the effectiveness of a specific gel bait. 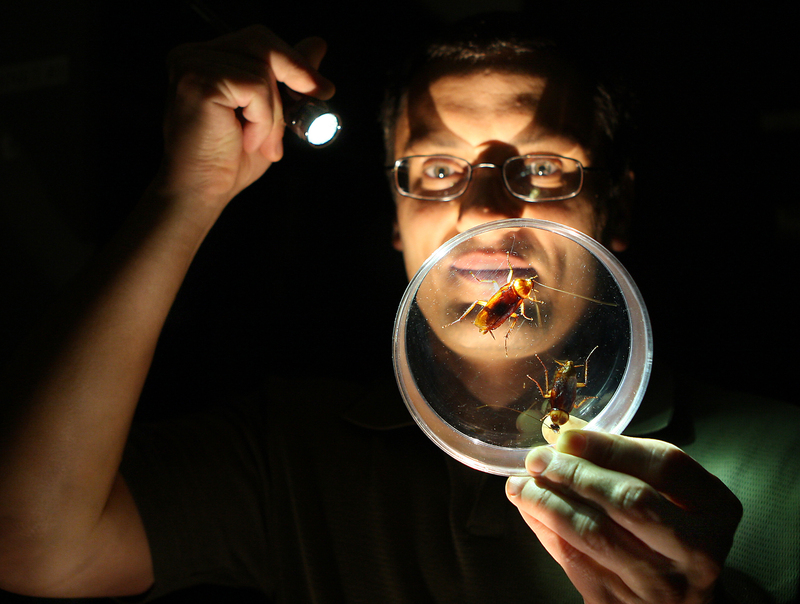 It is the first time that scientists have shown that a pest control bait will remain effective when it's transferred twice after the first killing dose, said Grzegorz "Grzesiek" Buczkowski, assistant professor of entomology. Passing the insecticide from one cockroach to the next is called horizontal transfer. "Our findings are exciting because cockroaches are difficult to control since they multiply so rapidly," Buczkowski said. "They are especially bad in urban housing, and they can cause health problems." It's difficult to find and rid areas of the insects because cockroaches come out at night and live in inaccessible places, he said. They invade places where they easily can find plenty of food and water. In addition, cockroaches are attracted to where other cockroaches are by a chemical compound, called pheromones, that animals secrete and which influences other cockroaches' behavior. In a laboratory study, the scientists used German cockroaches, the most common household species in the United States, to test a DuPont product with the active ingredient indoxacarb. Although the researchers only studied indoxacarb, Buczkowski said it's possible other insecticides also may have three-generation horizontal transfer kill capabilities. In the first transfer of the insecticide from a dying adult to the youngest stage nymphs, an average of 76 percent of these cockroaches also succumbed to the indoxacarb-containing excretions from the dying cockroaches, the researchers report in the June issue of the Journal of Economic Entomology. In the third stage of transfer, or tertiary kill, an average of 81 percent of the adult male cockroaches that ate the dead nymphs' bodies also died. Both statistics were taken 72 hours after the insects were exposed to a cockroach already affected by indoxacarb. Mortality of cockroaches at the fourth level, three times removed from the original insecticide dose, was not any higher than for those insects that hadn't been exposed to the insecticide through any method, said Buczkowski, director of the Purdue Industrial Affiliates Program. Adult German cockroaches are a shiny orangey tan and about half an inch long. The youngest nymphs, as used in this study, are called first instars and are one to five days old. Nymphs go through five stages on their way to adulthood. In addition to attracting more cockroaches with the pheromones in their feces, the insects can cause other problems. "Cockroaches molt their skin as they go from one nymph stage to the next, and there is a huge accumulation of the skin left in the areas where they live," Buczkowski said. "The dead skin becomes airborne and causes allergies and asthma. It's really the biggest problem with cockroaches." Buczkowski plans to investigate tertiary kill with other cockroach baits and possibly look at horizontal transfer of insecticides in natural settings rather than just in the laboratory. The other researchers involved in this study were Gary Bennett, Purdue entomology professor, and Clay Scherer, global product development manager for DuPont Professional Products. The Purdue Industrial Affiliates Program and DuPont funded this project. The Purdue faculty members involved in the research have no financial interest in DuPont or its insecticide Advion® Cockroach Gel. Note to Journalists: Purdue researcher Grzegorz "Grzesiek" Buczkowski's name is pronounced Jess-ick Boo-cow-ski. Horizontal transfer of indoxacarb in the German cockroach, Blattella germanica was examined under laboratory conditions. We demonstrate a unique trophic cascade that leads to tertiary mortality. We show that a single primary donor transfers indoxacarb to numerous primary recipients (secondary mortality), which then become secondary donors. These recipients subsequently become donors to other cockroaches and cause significant mortality in other members of the aggregation resulting in tertiary kill. Our results demonstrate that indoxacarb is effectively transferred among adult cockroaches and results in significant secondary mortality. When adult males served as donors and vectored the insecticide to adult males the donor: recipient ratio affected the mortality of the recipients and the rate of secondary mortality increased with increasing the ratio of donors to recipients. Furthermore, secondary mortality in the untreated cockroaches was significantly affected by the freshness of excretions from the donors, the presence of alternative food, and the duration of contact between the donors and the recipients. Ingested indoxacarb was most effectively translocated when the recipients interacted with freshly symptomatic donors in the absence of alternative food. We also show that the transfer of indoxacarb continues beyond secondary mortality and results in significant tertiary mortality. Excretions from a single bait-fed adult killed 38/50 (76%) nymphs within 72 h. The dead nymphs then vectored indoxacarb to 20 adult males and killed 16/20 (81%) recipients within 72 h. Behavioral mechanisms involved in the horizontal transfer of indoxacarb may include: necrophagy, emetophagy, and ingestion of other excretions that originate from the donors.